An Unforgettable Night of Music and Photos! 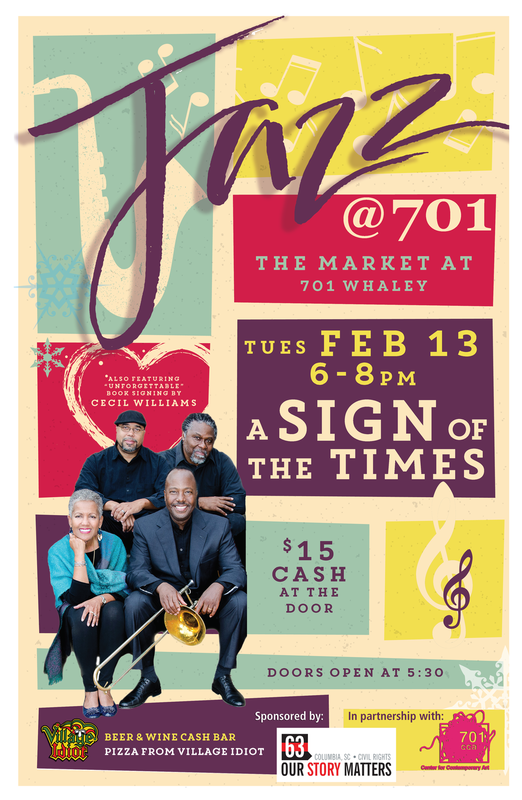 Sponsored by Columbia SC 63: Our Story Matters, and in partnership with 701 Center for Contemporary Art, Jazz@701 brings back A Sign Of The Times! Renowned photographer Cecil Williams will also be on hand with his new book “Unforgettable.” Mr. Williams is well known for his vast work documenting the civil rights movement of the 50’s and 60’s, but he has also pointed his lens at well known southerners like jazz legend Skip Pearson! Led by Composer/Director, Tyrone Jefferson, A Sign of the Times’ are committed to the mastery and preservation of Jazz – the only musical genre born in America! Their repertoire swings and transports listeners to the days of Dizzy, Bird, Miles and Sassy as well as Earth, Wind & Fire, Marvin Gaye, the Stylistics, Etta James and James Brown. Each musical story is told with authenticity and reverence to the great ones that came before us. Known by many as Charlotte’s premier Black-owned music organization, they will lift your spirits and stir your soul! Governed by the Charlotte-based 501-C (3) non-profit, A Sign of the Times of the Carolinas, the ensembles are the vehicles used to accomplish the organization’s mission to preserve the legacy of the African Diaspora through music, dance and the spoken word – they are so much more than a band!